In 2002 I won the Mark Tanner Award for Sculpture and was commissioned to make work for a 1 person show at Standpoint gallery in the East End of London. I chose to make site-responsive artworks for the small spaces there. The gallery had been used at one time for marketing leather and wood veneers and there is still a feeling of a hierarchy visible even in the floor. The boss’s office has an oak parquet floor but that for the secretary has only a pine veneer. 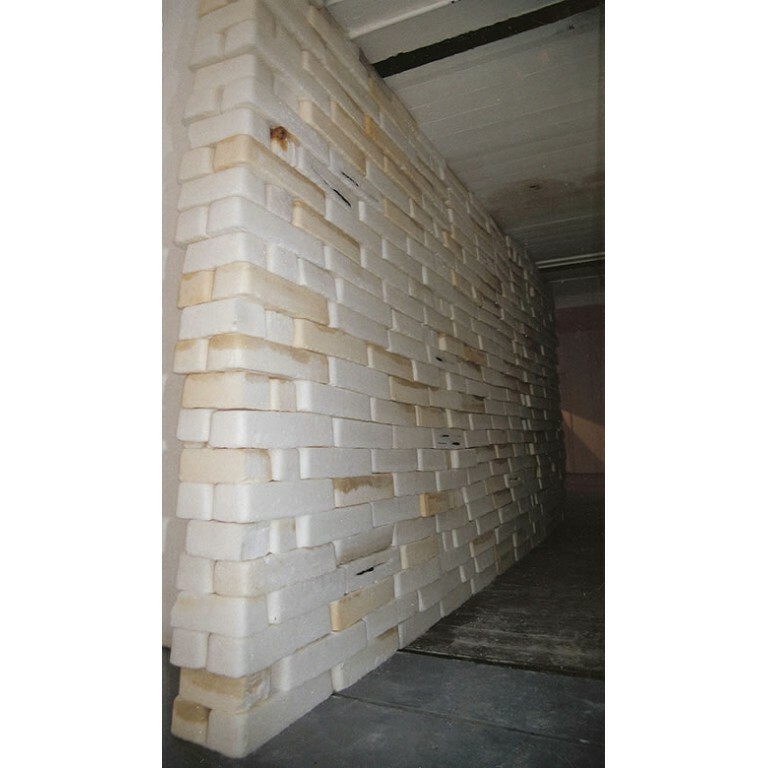 For the show I made a wall of giant sugar bricks weighing nearly a ton. I baked each one 3 at a time in the oven at home, with abattoir knives embedded into some. Visitors were able to walk past and touch the piece which was about 2 metres tall and passed through the now redundant lift. There was also a room installation situated in the small cellar space below. It was covered by a laser-cut steel grid over the opening with dirty water welling up from below, and the endless sounds of repetitive sweeping. Abattoir knives, baked white granulated sugar. Commission: Standpoint Gallery, London UK.